AGM & Tour of France 2017 by Ray Draper. Thursday saw an early start for the group (08.30!) en route to the city of Bourges, some two hours distant. To the east of Bourges lies the village of Avord, where in there is a small museum owning 6 complete aircrafts spred out in different locations - (4 at the museum plus the fuselage of a naval Xingu, 1 each in their storage hangar, in the village and at the nearby base). 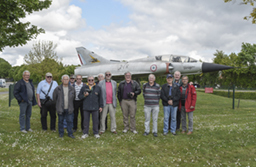 It is run by the community, covering the history of the local base, now home to Armée de l’air, Xingus and E-3F AWACS aircraft. 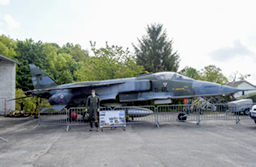 Outside we met our two hosts; on permanent display are a Jaguar, Mirage IIIE, Mystere IVA and an Alouette II. Our hosts showed us the more interesting items in a single crowded room most interesting were the recovery work and then memorials to three downed Allied Forces aircraft. 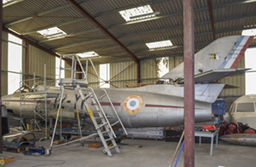 After the comprehensive briefing of the museum assets which have been accumulated in less than 20 years, we went along to a lock-up building in the village where another Mystere IVA, weaponry and some simulators were stored, before finally going to the Mirage IIIB on permanent display. This small but interesting museum was well worth the detour to visit. BRAVO POUR CETTE REALISATION ET BON COURAGE . de la part de BERNARD ""BOUFFY" CAYRIER fondateur et créateur du musse d'avions de chasse de MONTELIMAR et ex pilote du 1/7 PROVENCE et 2:7ARGONNE. ET surtout merci de garder précieusement le JAGUAR No 22 sur lequel j'ai effectué plus de 20 vols (sur les 1360 H de jaguar A etE. Merci à TAQUET le gardien de l'histoire de la 11 et autres. Nous nous sommes rendus au pôle aéronautique d'Avord au mois d'août. Le musée était très complet et le président (qui était notre guide) très intéressant. Nous attendons avec impatience l'ouverture du nouveau pôle! Félicitations à l'association et bonne continuation!